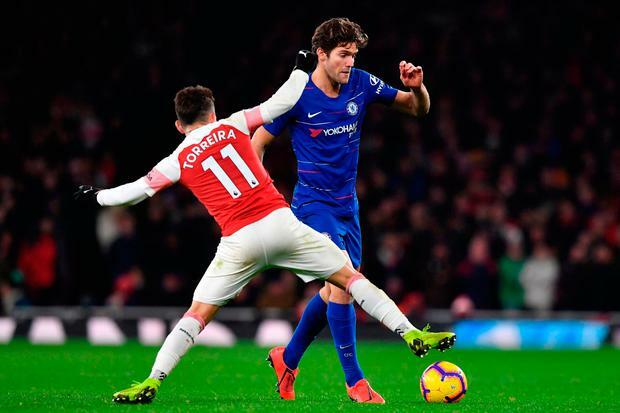 Marcos Alonso insists Chelsea must use their defeat at Arsenal as motivation - after Blues boss Maurizio Sarri slammed his players for their under-par performance at the Emirates Stadium. The Gunners were deserved 2-0 winners on Saturday as Alexandre Lacazette and Laurent Koscielny scored first-half goals for Unai Emery's side. Speaking in his native Italian, an angry Sarri accused his squad of being "extremely difficult" to motivate. "It was a good opportunity," he said. "We wasted it and now we have to work even harder to stay in a Champions League position and win games. It has to motivate us." The Spain full-back believes "silly" errors led to the loss and knows the players need to respond immediately as they head into the second leg of their Carabao Cup semi-final on Thursday, trailing 1-0 to Tottenham on aggregate. "We made silly mistakes," he added. "We provoked them to gain confidence and come to press us because we were making mistakes. "In the second half we tried but it was too late and we couldn't score. "When you lose, you learn. We have to analyse the game and improve quickly because there is no time to think. ''We have to perform again in four days." While Chelsea's motivation was called into question, Granit Xhaka praised the collective character of the Arsenal players, who got back to winning ways after losing at West Ham. "We had a difficult game against West Ham and we knew that if we didn't win today it that finishing in the top four would be difficult," he said. "But we showed amazing character and team spirit. They also didn't score against us, so we are happy to take the three points. "We said before the game that if you don't fight and you don't win the duels then it will be difficult because Chelsea have a good team."